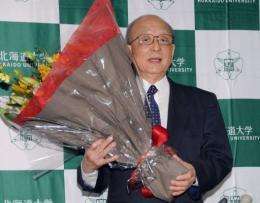 Japanese scientist Akira Suzuki receives a flower bouquet at Hokkaido University. Richard Heck and Japanese counterparts Ei-ichi Negishi and Suzuki were awarded the Nobel Chemistry Prize for forging a toolkit to manipulate carbon atoms. Their work paves the way for new drugs to fight cancer and for revolutionary plastics. Three scientists shared the 2010 Nobel Prize for Chemistry on Wednesday for forging a toolkit to manipulate carbon atoms, paving the way for new drugs to fight cancer and for revolutionary plastics. Richard Heck of the United States and Ei-ichi Negishi and Akira Suzuki of Japan were hailed for producing "great art in a test tube." The trio separately made outstanding contributions in organic chemistry, a field whose basis is carbon, one of the essential elements of life and also of innumerable industrial synthetics. "It is important to emphasise the great significance their discoveries have for both academic and industrial research and in the production of fine chemicals -- including pharmaceuticals, agricultural chemicals and high-tech materials -- that benefit society," the Royal Swedish Academy of Sciences said. Through their work, organic chemistry has developed into "an art form, where scientists produce marvellous chemical creations in their test tubes," it said. Heck, 79, retired in 1989 from the University of Delaware in the United States; Negishi, 75, was also based in the United States, at Purdue University in Indiana; Suzuki, 80, was based at Hokkaido University in Sapporo, Japan. The trio developed a process known as palladium-catalysed cross coupling, a means of knitting carbon atoms together so that they form a stable "skeleton" for organic molecules. It has allowed chemists to synthesise compounds to fight colon cancer, the herpes virus and HIV, as well as smarter plastics that are used in consumer applications, such as ultra-thin computer monitors. The discoveries "have had a great impact on academic research, the development of new drugs and materials, and are used in many industrial chemical processes for the synthesis of pharmaceuticals and other biologically active compounds," the academy said. The Nobel has been awarded on four previous occasions for breakthroughs in organic chemistry -- in 1912, 1950, 1979 and 2005. In the 1960s, Heck laid the groundwork for coupling between carbon atoms by using a catalyser, or chemical to promote the process. This was fine-tuned in 1977 by Negishi, who used a field of compounds known as organohalides, and taken a step further by Suzuki, who found a practical way to carry out the process using so-called organoborons. Each of the three have lent their names to important chemical reactions. The Nobel jury pointed out that "today the Heck reaction, Negishi reaction and Suzuki reaction are of considerable importance to chemists." Negishi said in an telephone interview with Swedish television that he was "sound asleep" when he got the crucial phone from Stockholm at around 5:00 am at home in Indiana. 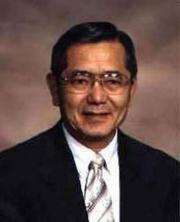 Ei-ichi Negishi was awarded the Nobel Chemistry Prize by the Swedish Academy of Sciences in Stockholm. Negishi, Akira Suzuki and Richard Heck were awarded the Nobel Chemistry Prize for forging a toolkit to manipulate carbon atoms. Their work paves the way for new drugs to fight cancer and for revolutionary plastics. US scientist Richard Heck has awarded a share of the Nobel Chemistry Prize by the Swedish Academy of Sciences in Stockholm. Ei-ichi Negishi Negishi, Akira Suzuki and Heck were given the award for forging a toolkit to manipulate carbon atoms. Their work paves the way for new drugs to fight cancer and for revolutionary plastics. "I am extremely happy," he said. He said there had been "some people mumbling" that he could be awarded the Nobel, leading him to "vaguely" consider the possibility of becoming a Nobel laureate. Suzuki told a press conference at Hokkaido University that he was "very pleased to have received such an honourable prize." "It is especially important for such a resource-scarce country like Japan to develop in the area of science, because (Japan) can only thrive on its people's efforts to build knowledge," Suzuki added. "I want to continue working for the betterment of younger generations," the 80-year-old laureate said. Britain's Royal Society of Chemistry said it was not surprised by Suzuki's award, only that it had come so late. He retired as a professor in 1994 after reaching a mandatory retirement age but remains an emeritus professor at Hokkaido, the university's website said. "I'm very pleased to receive the prize," Heck told AFP when reached by telephone in the Philippines, where he now lives, saying dozens of people had gathered to congratulate him. Heck, who retired in 1989, called his discovery "a useful laboratory reaction, with major applications in industry." "But much of that is secret, and that is because they want to keep their patents" closely guarded, he said. The American Chemical Society President Joseph Francisco said in a statement the Nobel committee's selection of Heck, Negishi and Suzuki was "wonderful." "The winners are among the foremost scientists of our era," he said. "Their research has led to creation of new molecules and compounds that have improved the lives of millions of people." Last year, Venkatraman Ramakrishnan, Thomas Steitz and Ada Yonath won the Chemistry Prize for work on the ribosome, a cellular process that makes proteins, the stuff of life. Heck, Negishi and Suzuki will share 10 million Swedish kronor (1.49 million dollars, 1.09 million euros) and each receive a medal. Richard F. Heck, one of three scientists who share this year's Nobel Prize in Chemistry, created a chemical tool that opened up new research possibilities for chemists and medical researchers. Now an emeritus professor at the University of Delaware, Heck was named Wednesday as one of three professors sharing the 2010 Nobel prize for his invention of a chemical reaction that bears his name. The so-called palladium-catalyzed cross coupling may be little known outside Heck's field, but to chemists it threw open the door for a range of experiments previously stymied by the difficulty of inducing carbon atoms to react with one another. The Heck reaction, and those developed by his co-winners Ei-ichi Negishi and Akira Suzuki, collects stubborn carbon atoms on a palladium atom, where they are close enough to react. Born 1931 in Springfield, Massachusetts, Heck obtained his Ph.D. in 1954 from the University of California, Los Angeles. He received his undergraduate degree from the same institution. 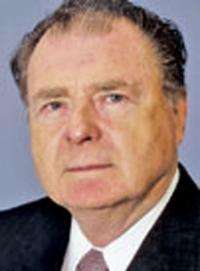 After graduating, he spent time at the Swiss Federal Institute of Technology in Zurich and then worked at a Delaware chemical firm called Hercules Powder. In 1971, he joined the faculty of the University of Delaware's Chemistry and Biochemistry Department, where he developed the reaction for which he would become most famous. University president Patrick Harker said the school was "exceptionally proud" of Heck and his research. "This is a tremendous accomplishment for Professor Heck and his colleagues, acknowledging the development of a tremendously sophisticated tool that will aid scientists to make potential cancer drugs and medicines," university provost Tom Apple said in a statement. In 2006, his work earned him the Herbert C. Brown Award for Creative Research in Synthetic Methods from the American Chemical Society, which lauded the "profound impact" of the Heck reaction. "The importance of this reaction cannot be overstated," the society said. On Wednesday, ACS President Joseph Francisco said the Nobel committee's selection of Heck, Negishi and Suzuki was "wonderful." "The winners are among the foremost scientists of our era," he said in a statement. "Their research has led to creation of new molecules and compounds that have improved the lives of millions of people. It gave us revolutionary new medicines, plastics and other products that improve the lives of people everywhere." Heck retired from the University of Delaware in 1989, moving to Florida while retaining the title of Willis F. Harrington Professor Emeritus. The university established an award and lectureship in his name in 2004 "to recognize visionary leadership in the field of organometallic chemistry, and to honor the contributions of Richard F. Heck." Japan's Prime Minister Naoto Kan Wednesday congratulated two Japanese scientists -- Ei-ichi Negishi and Akira Suzuki -- awarded the 2010 Nobel Chemistry Prize shared with an American researcher. "I am very delighted that the two received the Nobel Chemistry Prize," Kan told reporters. Kan said that on hearing the news he immediately telephoned Suzuki, a professor emeritus at Hokkaido University on the northern main island of the same name, and congratulated him on his achievement. "Mr Suzuki then requested that the government make better use of Japan's science and technology capabilities, which are at the top of the global standard," Kan said. Suzuki and Negishi, who is based at Purdue University of Indiana shared this year's chemistry prize with Richard Heck of the United States for pioneering research in linking carbon atoms. The Royal Swedish Academy of Sciences lauded the trio's work in "the development of palladium-catalysed cross coupling." The jury said the tool "vastly improved the possibilities for chemists to create sophisticated chemicals," and had applications in medical, electronics and agricultural fields.